Inventory We are a resale marketplace, not a box office or venue. Ticket prices may exceed face value. This site is not owned by American Airlines Arena . 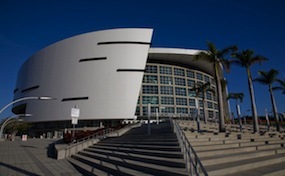 American Airlines Arena opened December 31, 1999 on 601 Biscayne Boulevard in downtown Miami, Florida. AmericanAirlines Arena is home to the National Basketball Association's Miami Heat. American Airlines Arena was built for $213 million and has a seating capacity of 19,600. American Airlines Arena box office has played host to a number of big events including concerts, sports, and other shows. Some of the most memorable American Airlines Arena tickets were the 2013, 2012, and 2006 NBA Finals, MTV Video Music Awards, 2009 NCAA Men's Basketball Tournament, Latin Grammy Awards, UFC, and concerts by Taylor Swift, Celine Dion and Britney Spears. ArenaMiami.com is a privately owned and operated company that specializes in online sales in the secondary ticket market. We are not affiliated with any primary box office or venue. To purchase tickets at anytime online to all American Airlines Arena events simply call our operators at anytime or click on the event you wish to attend and follow the steps through checkout.